Tagline: A beast consumed with pain could be her greatest pleasure. Roxie Maeda is a college senior who hears voices in her head. When she first sees the demonic creature haunting her crush, she blows it off as a hallucination, but then it shows up in her Psych class, visible to everyone. Its appearance triggers a police search of the campus, which reveals a bag of guns right outside the classroom. Someone was planning to shoot up the school. Over time, the creature discloses that he is a pain eater—a cursed, undead human who eats pain demons that arise from injuries, taking the pain into himself. His selflessness sways her, and she befriends him only to fall in love. Together, they resolve to break his curse and save Prometheus University from its unknown attacker. Without closing my eyes, I slowly wrapped my mind around what the guy in black was. Monster. Supernatural. Something that wasn’t supposed to exist. But what exactly was he? Could he be a ghost? He could walk through walls. He could disappear. What kind of ghost dresses like some kind of assassin and gets his jollies from causing campus lockdowns? It didn’t fit. Plus, he was flesh and bone when I hit him with the knife. I thought about banshees, but banshees were female, weren’t they? I thought about Japanese shinigami, escorts to the underworld—but no one had died. Courtney has an English degree with a Writing Concentration from the University of South Carolina. She lives in Indiana with her Marine husband, two singing huskies, and three purring kitties. 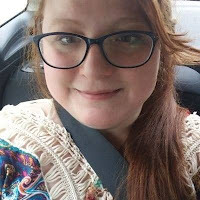 She blogs about her own experiences with mental illness.